have a short before bedtime story! Kovu had met Kiara for the first time and couldn't forget about her. Days after their first encounter that was brutally broken up by their parents, Kovu sneaked into the Pridelands while Zira was hunting. Nuka was his assigned babysitter, but fell asleep right after their mother ran off. Vitani shrugged when Kovu said he was going for a walk and would be right back. Easy escape, it was afternoon so there would be less predators for Kovu to fear. Kiara had the same idea, she told Simba and Nala that she was going to the watering hole for a swim, but she also snuck towards the Kingdoms border. It didn't take the two cubs long to detect each other. Good to see you Kiara, Kovu jumped around. What we do? We go to your lands! I want to see your brother and sister and where you live! Kovu nodded. Lets go then, run! They runned towards the Outlands and to the termite hill area. Nuka was still napping and Vitani was busy pulling woods. Vitani, Nuka! I have a visitor! Who are you? rarr! Vitani hissed. Shut it, Vitani! Nuka replied. This is Kiara, my new friend I met and told you about yesterday! The princess, Simbas daughter? Nuka asked. Yes, that is me, I am Kiara! Wanna play? Vitani and Nuka nodded. Mother must not find out! Kovu warned. Kovu and Kiara teamed up and played hide and seek with Nuka and Vitani. Vitani was smart and found them. Nuka was not smart and got lost. Kovu, Kiara and Vitani found him. Laughing, they did tag along, Nuka was not amused because they laughed at him, but he didn't say anything. Then Zira returned. Kiara and Kovu hid. Vitani and Nuka distracter their mother. I will smuggle you out of here, back home! 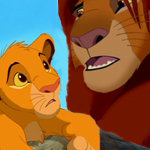 Kovu helped and guided Kiara back home to the border land. Thanks for all the fun! You are welcome, see you soon ok? Kovu answered. They greeted and agreed to meet as soon as the time was good for it. Kovu ran off towards the Outlands and Kiara ran back to Pride Rock. While running, she saw the sun lowering. She smiled.